In the previous article, we discussed different ways to convert text to date in Excel. If you are looking for a solution to the opposite task - changing an Excel date to text - a few choices are available to you again. Traditionally, we'll begin with a formula solution and then explore a couple of non-formula ways. The Excel TEXT function is specially designed to convert a numeric value to a text string and display it in the format you specify. value is a numeric value you want to convert to text. This can be a number, a formula that returns a numeric value, or a reference to a cell containing a number. format_text this is how you want to format the resulting text value, provided as a text string enclosed in quotation marks. As you see in the screenshot above, the value returned by the TEXT formula is aligned to the left, which is the first sign that points to a date formatted as text. Apart from alignment in a cell, there are a few more indicators that can help you distinguish between dates and text strings in Excel. Since Excel dates are serial numbers in their nature, the Excel TEXT function has no problem with converting them to text values. The most challenging part is probably specifying the proper display formatting for the text dates. Microsoft Excel understands the following date codes. m - month number without a leading zero. mm - month number with a leading zero. d - days number without a leading zero. dd - day number with a leading zero. "mm/dd/yyyy" - the date format used in the USA, displays as 03/08/2015. "dd/mm/yyyy" - the date format used by the rest of the world, displays as 08/03/2015. "dddd, mmmm d, yyyy" - full date, including the day of the week, displays as Sunday, March 08, 2015. If your date entries display both dates and times and you want to change them to text strings exactly as they are, you included the following time codes in the format_text argument of the Excel TEXT function. h - hours without a leading zero, as 0-23.
hh - hours with a leading zero, as 00-23.
s - seconds without a leading zero. ss - seconds with a leading zero. AM/PM - displays as AM or PM. If not specified, 24-hour time format is used. The result of this formula would show up as 08-Mar-2015. If you prefer to display the resulting text string in some other format, please see the date codes discussed in Example 1. Though the main destination of the TEXT function in Excel is converting numbers to text, it can also perform a reverse conversion, i.e. change text to date. For this, you simply add the double negation (--) to your TEXT formula. For example, to convert a text string in cell A1 to date, you use the formula =--TEXT(A1,"mm/dd/yy") and then format the cell as a date. 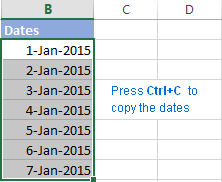 As you've just seen, Excel's TEXT function makes a good job of converting dates to text. But if you are not a big fan of Excel formulas, you might like this solution better. If you had a chance to read the previous part of our Excel dates tutorial, you already know how to use Text to Columns to change text to date. To convert dates to text strings, you proceed in the same way with the only difference that you choose Text instead of Date on the final step of the wizard. Note. The Text to Column wizard always converts dates in the default short date format regardless of how the original dates are displayed in your worksheet. You can find more about default date and time formats in the following article: Default date format in Excel. If the default date format is not what you are looking for, you can jump right to the next solution that lets you convert dates to text strings in any format of your choosing. In your Excel spreadsheet, select all of the dates you want to change to text. On the Data tab, find the Data Tools group, and click Text to Columns. On step 1 of the wizard, select the Delimited file type and click Next. 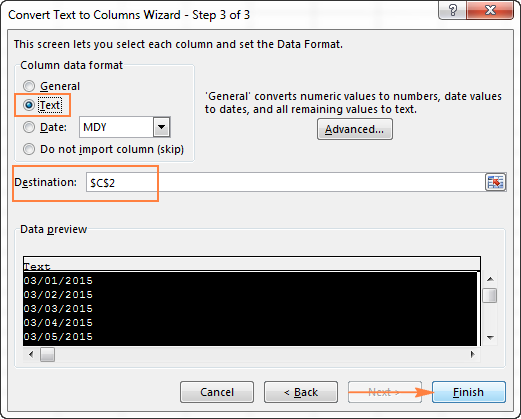 On step 2 of the wizard, make sure none of the delimiter boxes is checked and click Next. 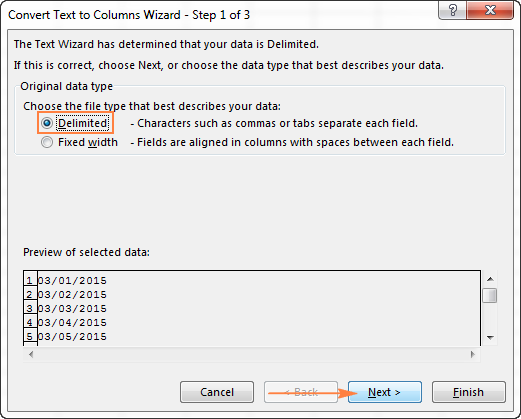 On step 3 of the wizard, which is the final step, select Text under Column data format and click Finish. Tip. If you don't want the resulting text strings to overwrite the original dates, specify the Destination for the top cell of the new column. Another quick no-formula way to turn Excel dates into text strings is using Notepad or any other text editor. 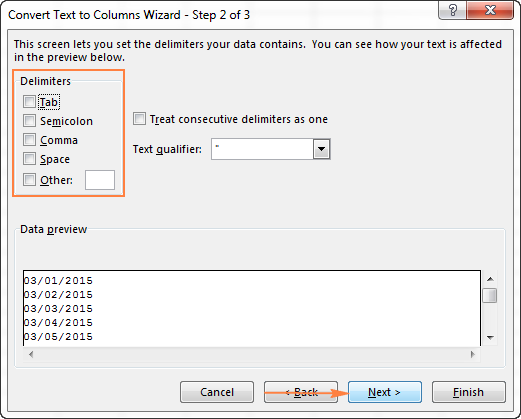 Unlike the Text to Columns wizard, it allows you to convert Excel date to text in any format of your choosing. 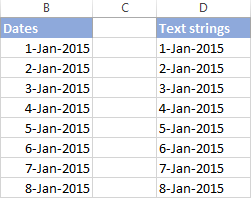 In your Excel worksheet, format the dates exactly as you want the text strings to look like. Select all of the dates you want to convert and press Ctrl+C to copy them. Open Notepad or any other text editor, and paste the copied dates there. Notepad automatically converts the dates to the text format. Press Ctrl+A to select all text strings, and then Ctrl+C to copy them. Switch back to Microsoft Excel, select the column where you want to insert the text strings and apply the Text format to it. To do this, press Ctrl+1 to open the Format Cells dialog and select Text on the Number tab. Finally, select the first cell where you want to insert the text strings and press Ctrl+V to paste them. The following screenshot shows the result, with the original Excel dates in column B and text entries in column D. Please notice that the converted text strings reflect the original date format with absolute accuracy, except they are left-alighted, as all text values are supposed to be in Excel. 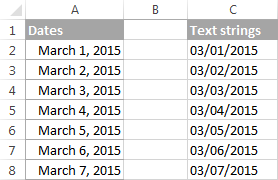 This is how you convert date to text in Excel. Next week we will explorer a few Excel functions to work with weekdays and days of the year. And in the meantime, you may want to check out the previous parts of our comprehensive tutorial to working with dates and times in Excel. Excel date format - explains how to change the default date format in Excel and create custom formatting. How to insert dates in Excel - this tutorial demonstrates how you can use Excel functions to convert text to date and how to turn text strings into dates in a non-formula way. How to convert text to date in Excel - learn various ways of entering dates in Excel: how to insert the today date and current time, how to auto populate a column or row with weekdays, and how to auto fill random dates in Excel, and more. 112 Responses to "How to convert date to text using Excel TEXT function and no-formula ways"
Please help me to solve the following issue. here I have certain shifts & their start time and end time. Your table was mangled during posting and I am not sure I can follow you, sorry for this. If you can post the same question on our forum and attach a sample worksheet for better understanding, our support team will do their best to figure it out. It may happen if a value in A1 is a text string, not a date. To check this, select A1 and look at the Number Format box on the Home tab in the Number group. If it displays General or Text, you are dealing with a text string that looks like a date. In this case, you will need to convert text to date first. Dear Svetlana, nope, the format is Date. Even if I point the formula to an empty cell, I get the same error. This does not seem right. Even when I use Datevalue and point to my date field that is either formatted as text or date, I get #VALUE! All other Excel formulas work perfectly. Unfortunately I cannot post screen shots here of my spread sheets to prove my points to you. I am afraid it's not possible to determine the root of the problem without seeing your data. If you can send us your sample worksheet at support@ablebits.com, I will try to help. Please help me some time if i save the Excel totally text format is changing to Date format. Now i need to change total Excel format Date format to Text format how can i change the format. I want to convert number of days to y m d.
Where A1 is the cell containing the number of days you want to convert. For 1092 days, the formula returns 2 years 11 months 27 days. i want some more i dont have days in there i have only Date of Joing a one person then i want everything do in a one cell. =DATEDIF(A1, TODAY(), "y") &" years, "&DATEDIF(A1, TODAY(), "ym") &" months, " &DATEDIF(A1, TODAY(), "md") &" days"
Thanks to you awesome tutorial I was able to convert date to text, but know I want to convert that text value into something measurable MINUTES. Can you please advise how can I perform or execute this conversion from TEXT(Date) to NUMBER (Minutes)? Any questions feel free to let me know. Please note that it will work correctly only if hours and minutes always contain 2 digits, with leading zeros if needed. I tried so much to find a way that i could use the number of the week of the year and the day of the week and make it a number. For example if we are in the 34th week of the year and the day is Tuesday then the text should show 3402. If its the 24th week of the year and the day is Monday then the text should show 2301 . The first 2 digits are the week of the year, and the other 2 digits are the monday-tuesday etc. Could you pls help me? I don't know a formula that could do this. Most likely a macro is needed in this case. Is there a formula to convert 18/09/2015 to "Weekday" or 6/09/2015 to "Weekend"? Where A1 is the cell with a date. Do you know of a way to increment months from a date value input so it'll automatically show up in correct month/year order in a table? Example: I have 12 columns, A to L. In K2, I input 9/20/15 (as the Start Date). Then for A5 to L5, I retrieve from K2 and it should automatically increment month/year (as needed). I want B5 to automatically become Oct '15, C5 to become Nov '15, D5 to become Dec '15, E5 to become Jan '16, and so on. Hello, i just want to know the formula if i input "date" from cell1, and on cell2, output will be the year only. Like for example if i input date 9/29/2015 on cell1, the output for cell2 must be "A" for year 2015. Then if year 2016, the output will be B, and so on. Thanks. Is there a way to sort the text dates in chronological order in a pivot once you've used the formula in the data? Is there a way to convert a birthday (01/15/2012) into number of months and days (45 months 1 day)? I need the number of months and days to keep a continuous count as of the current day. =DATEDIF(B2,TODAY(),"M") & " Months " & DATEDIF(B2,TODAY(),"MD") & " Days"
"Twenty ,Ten, Two Thousand Fifteen"
i want to add am/pm to each one. the date is currently in text mode. Wondering if you could help me. I have a date in cell AB5, in US english format (mm/dd/yyyy) and a formula =TEXT(AB5, "mmm/yy") in cell AX5. For some reason the formula returns the date in date format rather than my desired Mon/YY format- any ideas why this may be the case? Is there a way to construct a formula like the below to return nothing if the source cell is blank? Right now, it is returning Jan-OO for all empty cells. Ah - just saw your post; many thanks! I hope you can help me. I have 9/1/2015 12:11:53 PM (cell A2) which i need to convert into text. I have used some of the idea above which is =text(A2,"dd/mm/yyyy hh;mm;ss"), some cell works but some cell doesn't. Do you know is there any other ways to convert this? Thanks in advance. But when I tried what you recommended it didn't work. Is there another way? Thank you so much for the help! I've just tried the formula on my sheet and it has worked fine. How exactly doesn't it work in your Excel? Does it return a wrong result or error? If the latter, what error? Please help me - I have this birth date that I want to change to text ie 19720101 should read 01 Jan 1972, how do I do that? When I use the Text function within a formula, it is still displaying a number. Any reason why it is doing it? Note that when I try the function in a standalone cell, its working perfectly fine. ="select ric_code,exchange_code,expiry_date from smd_live_raw..t_ds_optfuture where expiry_date =TEXT(42587,"dd-mmm-yyyy")"
The number 42587 is being taken from a cell that contains a date. Hi Mam! Could you help me convert "Sat, May 14, 2016" into "14/5/2016" format and separate "Sat" from the string when the former started with asterisk mark. Thanks in advance. 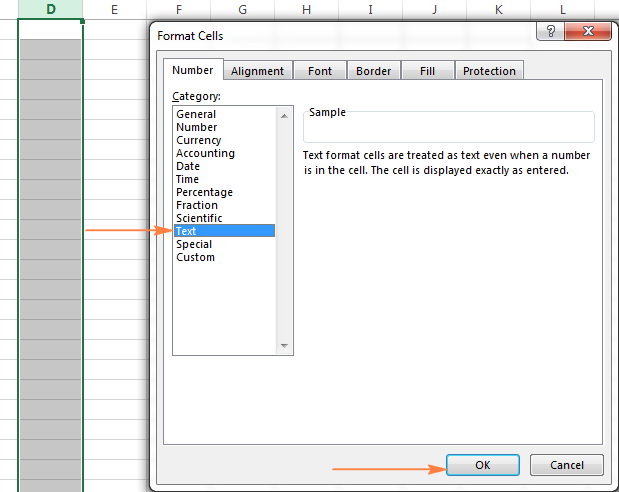 Select the cells, pres Ctrl+1 to open the Format Cells dialog, select Date under Category and choose the desired format. Or, select Custom under Category, and type mm/dd/yy in the Type box. for eg. 22.04.2010 - convert it into Twenty Two April 2010 or Twenty Two April Two Thousand Ten. how to convert date for example 14/07/2008 in word " Fourteenth Jun Tow Thousand"
=E1&" "&" "&E2&" "&TEXT(E3, "MMM YY ") formula. I want to change the year from 2016 to 2015 but when copy that formula and past it into the next cell the year stay the same even when I put it as paste fill without formatting. is it possible to covert a numeric date into complete Text format? e.g 13/02/2015 in thirteenth February Two thousand and fifteen. I would like to enter a ratio like "1:1" or "7:5" in a cell that has been previously formatted as Text. Excel 2013 constantly changes my entries to date/time formats. How hard is it for the geniuses in Redmond to understand that when I format a cell as Text I want whatever I enter in it to be displayed EXACTLY AS I HAVE ENTERED IT and NOT AS ANYTHING ELSE??????? I would like to convert date, i.e. 31-12-2015 into text format... like Thirty one - December - Two thousand fifteen. I would like to learn, how to convert 01.01.2016 to 01-01-2016 format. You can use Excel's Replace All feature to replace the dots (.) with dashes (-). The detailed steps with screenshots can be found here: How to convert text strings with custom delimiters to dates. that was very simple way of doing. Is there no other option, using Text and columns?? Covert text to date with Text to Columns. I prefer 'Replace All' because it's faster, but it's up to you. I'm using Excel 2010. Help please. Please note, the above formula will work only if all the dates are in the same format, i.e. dd/mm/yyyy. If there are dates formatted as d/m/yyyy (without leading zeros), you will need to convert text strings to dates first, and then apply =TEXT(D2, "ddmm") to the converted dates. I am trying to copy a either an entire worksheet or a range of data from one workbook to another. I can do this successfully manually, by selecting all the cells with data in them and pasting into a newly created worksheet (Date format is maintained). However when I try to do this via VBA any date with a day greater than 12 gets converted to text [US (m/dd/yyyy)/Australian (dd/mm/yyyy) format change]. I've tried formating the cells first to US format dates but this doesn't help. Any sugestions? Can you please help me to convert the date format 24/01/2017 in "Twenty-Forth January Two Thousand Seventeen"..?? How to convert 'January 18th 2017, 12:04 am' to '18/01/2017 12:04 AM' in Excel? Is there a way to have a cell pull date data from one cell (ex. May 15, 2017) to say 'Mid May' instead? How do you convert 2015-JAN-10 to read 01-10-15 in excel? When I write 2013 on my excel sheet I have the problem that excel sees it as 1905, I have tried to use =Year(2013), change format, use text to columns but doesn't seem to found a way to correct this, could you help me? I am trying to convert several weeks of date formatted eg;Wednesday, 1 March 2017 to straight text 'WED" for use in pivot table /graphs. Custom formatting using "ddd" still retains the "number" value, and using a notepad to convert will not work as I am using Macros. I am trying to make the formula that in cell A1 has a date and other cell B1 specific date or text i.e "Not Selected" and result in other cell C1 should be the month and days while cell B1 can be counted the today date. I could not make that formula. Please help me. Thank you in advance. Hello! I require conversion of date of birth (25/09/1998) to date of birth in words as "Twenty fifth September Nineteen Ninety Eight" in Excel. Please help me. Anybody help me to change this time format to words ? INT(D179)&" Days," & HOUR(N179)&" hours, " &MINUTE(N179)&" minutes and "&SECOND(N179)& " Seconds"
Apologies if you have covered this above, I have tried a bunch of your instructions that look applicable but none seem to work for me. If I want it in the same cell, can this be done by conditional formatting? If not, can the formula go in a cell away from the current columns (so I don't need to have two columns next to each other just for the conversion)? I am using "Text to Column" feature to convert date. however it is not converting the 29 February 2017. Grateful if you please guide. How can I return the 3 digits? but then this does not seem to be in an order if I am trying to filter quickly. How to convert date of birth in words. Please help in excel. I see you are trying to help users with Excel TEXT function used to format time. Well, I've faced problem in international environment, where different users may have different localization of Excel, as well as different local setting of Windows. It cause funny thing, that date formating in Excel TEXT function vary by local setting, e.g. "YYYY-MM-DD" in whatever English, "RRRR-MM-DD" in Czech, "VVVV-KK-PP" in Finish, etc. Excel is not converting it based on local setting, so formula created in one local setting, doesn't work in others. I understand it as MS Excel bug, but it doesn't help me to solve it. Have you ever seen this and are you aware of any solution/workaround, which may work? I'd appreciate any tip here. My workaround now is this formula: =YEAR(source date cell)&"-"&MONTH(source date cell)&"-"&DAY(source date cell). I'm not fully happy with the solution, as weakpoint is, it may result in single digit month and/or single digit day, which I want to keep as double digit (like 2017-09-01, instead 2017-9-1). Maybe it can be solved by some IF and counting of characters, but it's going to be way too complex, comparing to =TEXT(source date cell; "YYYY-MM-DD"). Any idea or tip here is very welcomed. This does all I need EXCEPT I want to change the short date format the text comes through in. I need it to be yyyy/mm/dd. Do I have to change my regional settings or is there another way to do that? how to do this i have 3 column with date and i want it if there is a date display the date but if its blank display the other date in the column. An interesting problem you have posed. I cannot be certain that all of the information needed to answer you is available in your question but potentially there are solutions. Firstly you need to know whether the dates like 15.04.2017 are true dates or text. Secondly, you need to consider whether the format (appearance) as 15.04.2017 is simply a result of the locale you are using and if so what the default date format is for that locale. I presume, because you ask about displaying them as 15-04-2017 that you have already tried to format the dates to display differently using the Format|Cells|Dates options and have found that they do not respond. This suggests that the dates are text not true dates. The locale that is used then becomes irrelevant. Text is literal (wysiwyg). I shall not reproduce all that he says here. If when you try to access it you find that it has been taken down, post an email address here and I shall send a copy to you. In brief, it is designed for a column of dates, and uses the Excel Text to columns functionality, so there is an assumption that you have a column of 'dates' which Excel presently treats as text. The solution converts the text to real dates. Once you have true dates you can then choose to format the cells as dates in whatever format is appropriate. If the file is to be shared across multiple locales then you may rather than using the standard date formats available for particular locales, which can result in differences such as you see (15.04.2017 which may appear in other locales as 15/04/17, 04/15/17 or even 17/04/15) set up a custom date format. For the custom date format, sadly, I cannot help. If we get a good reply to my post below (73), we may then know how to set one up, but as far as I can see Excel does not respond helpfully across locales, so eg dd-mm-yyyy -> 'dd-00-yyyy' in a German locale, and dd-MM-yyyy -> 'dd-05-yyyy'. We have to use TT-MM-JJJJ, which is of little help if you are in a different locale. Finally, I have just noticed that you can select a locale for the date format using Format|Cells|Dates, which will allow you to apply a standard format to display 15-04-2017. English (India), possibly others, contains this format. Whether this works if the file is later transferred to a different locale, I am sorry I do not know the answer to that. A useful article with many good hints and tips but sadly did not address my specific issue. I have in Excel a cell '_p_end' which contains a date, say 31/05/2018, which is entered by a user. This is converted to text by =TEXT(_p_end,"dd/mm/yy") to be used in later reports. "dd/mm/yy" is not a valid date format in German. I can not change the formatting of date that was downloaded form txt file(notepad). From this one 22-10-2018 23:01:01 d/m/yyyy hh:mm:ss to 10-22-2018 23:01:01 m/d/yyyy hh:mm:ss. I even copy that to different sheets but it doesn't work. HI. I have a spreadsheet where the date has been supplied in dd.mm.yy format - Using dots. I want to change this to just using the Month. I have tried using the formula =SUBSTITUTE(E2,". ","/") but then I can't change than data to only show month? If I need to convert from text to data the information below, what formula do I have to use? I have to mention that I have all this dates in the same column.